The South Coast Climate Change Coalition seeks to help local communities in the South Coast identify resources to address the real-time effects of climate change and enhance the environmental and economic resiliency of these communities. Mar 8, 2018 A trove of centuries-old documents, recently found archived in dusty boxes at the Massachusetts Institute of Technology and Harvard, shows that the pair of massive nor’easters that pummeled the region’s coast this winter were among the most powerful tidal storms since the 1800s, scientists say. Feb 20, 2018 Two recent studies show that we still need to ramp up our efforts on climate change mitigation. In the annual Worldwide Threat Assessment, US intelligence agencies warn that global instability could result if climate change continues unabated. This messaging is in contrast to recent policy papers from the Department of Defense, which did not mention climate change. Feb 20, 2018 The world is far off course from its goals in cutting greenhouse gas emissions - and research published Tuesday illustrates one of the most striking implications of this. Namely, it finds that for every five years in the present that we continue to put off strong action on climate change, the ocean could rise an additional eight inches by the year 2300 - a dramatic illustration of just how much decisions in the present will affect distant future generations. Feb 12, 2018 Did you catch former vice president Al Gore’s interview with Boston Globe reporter David Abel? In town for a speaking event at Tufts University, Gore spoke with the Globe about the challenges of addressing climate change in the Trump era. Feb 1, 2018 NASA confirms spike in global methane gas. The planet just had its hottest 4 years in recorded history. Trump is dismantling efforts to fight climate change. Jan 18, 2018 2017 was among the hottest years ever recorded, government scientists reported Thursday. The year was the second-hottest in recorded history, NASA said, while scientists from the National Oceanic and Atmospheric Administration reported 2017 was the third-warmest they have ever recorded. 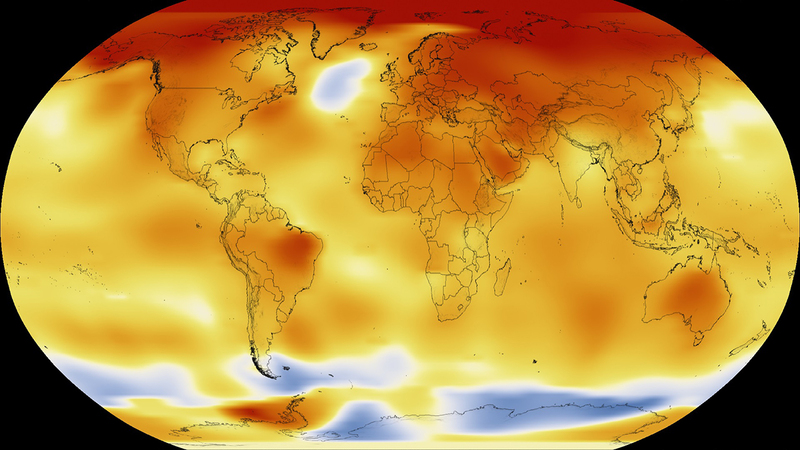 The two government agencies use different methodologies to calculate global temperatures, but by either standard, the 2017 results make the past four years the hottest period in their 138-year archive. Jan 18, 2018 Earth’s global surface temperatures in 2017 ranked as the second warmest since 1880, according to an analysis by NASA. Continuing the planet's long-term warming trend, globally averaged temperatures in 2017 were 1.62 degrees Fahrenheit (0.90 degrees Celsius) warmer than the 1951 to 1980 mean, according to scientists at NASA’s Goddard Institute for Space Studies (GISS) in New York. That is second only to global temperatures in 2016. Jan 12, 2018 Climate experts from NASA and the National Oceanic and Atmospheric Administration (NOAA) will provide the annual release of data on global temperatures and discuss the most important climate trends of 2017 during a media teleconference at 11 a.m. EST Thursday, Jan. 18. Jan 8, 2018 The “bomb cyclone” of a blizzard we experienced last week wasn’t just an excuse to hunker down with hot cocoa; it was also a reminder of how imperative it is that Massachusetts start adapting today to climate change impacts. Jan 6, 2018 With its gradually sinking, low-lying lands, and development right up to the water’s edge, Boston has long been considered uncommonly vulnerable to rising sea levels. But that long-term climate forecast became bracingly immediate on Thursday when a powerful winter storm, of a type known to meteorologists as the bomb cyclone, whipped up a record tide that sent waves surging through the streets of downtown Boston. Jan 4, 2018 Last week, President Trump forced us to address the easy question about climate change and winter cold. No — experts loudly responded to a Trump tweet — unusual cold in one region of the globe during winter does not mean the globe as a whole is not warming. The far harder question is how climate change will alter the experience of winter itself. It will — it already has. Dec 21, 2017 Researchers plotted temperature rises against the number of asylum applications and are predicting that as the southern hemisphere heats up the number of people migrating to the EU each year will triple. Climate change will drive a huge increase in the number of migrants seeking asylum in Europe if current trends continue, according to a new study. Dec 15, 2017 For decades it's been well understood that soft-sand beaches move - and that hard structures like concrete sea walls and stone jetties can in fact accelerate erosion. With climate change - rising sea levels and more frequent violent storms - the inevitable beach erosion and migration has only increased. Dec 14, 2017 Extreme weather left its mark across the planet in 2016, the hottest year in recorded history. Record heat baked Asia and the Arctic. Droughts gripped Brazil and southern Africa. The Great Barrier Reef suffered its worst bleaching event in memory, killing large swaths of coral. Recent ice-sheet modeling papers have introduced new physical mechanisms—specifically the hydrofracturing of ice shelves and the collapse of ice cliffs—that can rapidly increase ice-sheet mass loss from a marine-based ice-sheet, as exists in much of Antarctica. This paper links new Antarctic model results into a sea-level rise projection framework to examine their influence on global and regional sea-level rise projections and their associated uncertainties, the potential impact of projected sea-level rise on areas currently occupied by human populations, and the implications of these projections for the ability to constrain future changes from present observations. Under a high greenhouse gas emission future, these new physical processes increase median projected 21st century GMSL rise from ∼80 to ∼150 cm. Revised median RSL projections for a high-emissions future would, without protective measures, by 2100 submerge land currently home to more than 153 million people. The use of a physical model indicates that emissions matter more for 21st century sea-level change than previous projections showed. Moreover, there is little correlation between the contribution of Antarctic to sea-level rise by 2050 and its contribution in 2100 and beyond, so current sea-level observations cannot exclude future extreme outcomes. The South Coast region stretches from the eastern shore of Narragansett Bay in Rhode Island to Buzzards Bay in Massachusetts and includes the cities of Fall River and New Bedford.